Description: Aloe vera is a stemless or very short-stemmed succulent plant growing to 60–100cm (24–39 inch) tall, spreading by offsets. The leaves are thick and fleshy, green to grey-green, with some varieties showing white flecks on the upper and lower stem surfaces. The margin of the leaf is serrated and has small white teeth. The flowers are produced in summer on a spike up to 90cm (35 inch) tall, each flower being pendulous, with a yellow tubular corolla 2–3cm (0.8–1.2 inch) long. Like other Aloe species, Aloe vera forms arbuscular mycorrhiza, a symbiosis that allows the plant better access to mineral nutrients in soil. Light: Keep the Aloe vera plant in a bright location, with some direct sun in winter. If it is moved outdoors for the summer, make the move a gradual one. Ironically, Aloe vera sunburns easily if it is suddenly exposed to full sun. Water: During active growing period Aloe vera should be well watered and allowed to dry before watering again. Keep the soil slightly drier in winter, water it only enough to keep the plants from shriveling. Do not allow the soil to dry out completely. Aloe vera will do well in average room humidity. Brown leaf tips on Aloe vera plant usually indicate that it is not getting enough water. Water the plant thoroughly and allow the excess water to drain. Black spots on leaves are often due to overwatering. Do not allow water to collect in the rosettes of leaves, which causes the plant to rot. Temperature: In the home environment, temperatures should range between a high of 30°C (85°F) to a low of 10°C (50°F). Average room temperatures 18-24°C (65-75°F) will be perfect for Aloe vera. Potting and repotting: Repot young plants in spring when they are outgrowing their pots. These types of succulents freely produces offsets. Keep plants from getting overcrowded by propagating offsets as they begin to form rosettes. Use cactus potting mix or add 1 part coarse sand with 2 parts all-purpose potting mix. Propagation: Cut off new offsets in spring or early summer. Allow the cut portion to dry for a day or two to prevent the sap from oozing, then pot it in barely moist sandy potting mix. Problems: Check it once in a while for scale insects and mealybugs that may infest this plant. Treat any infestation for these house plant pests immediately with insecticide. 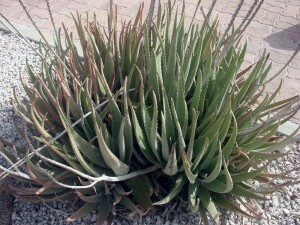 Uses: Grown in containers, Aloe vera make a remarkable houseplant or installed on porches, patios, decks, etc. In the landscape (warm climates only), its need for good drainage makes it a popular choice for rock gardens. 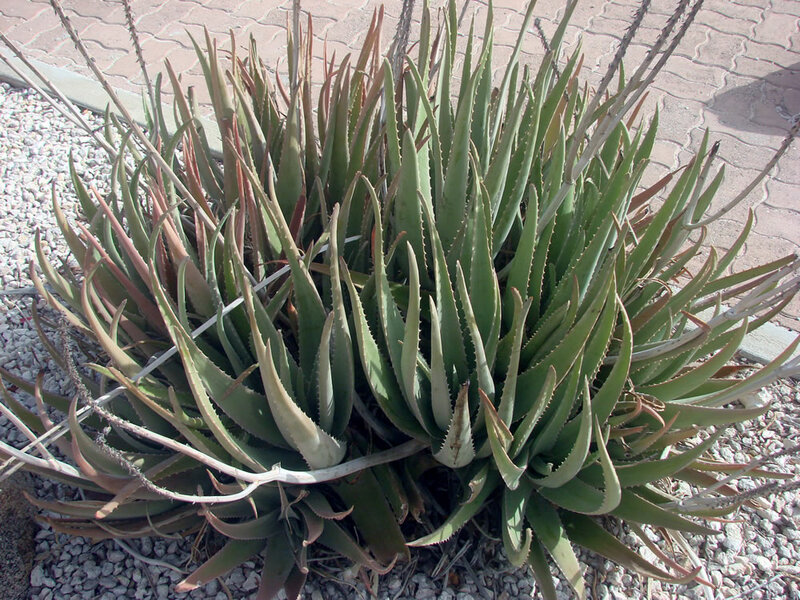 Aloe vera is drought-resistant once established, making an ideal choice for xeriscaping. Extracts from Aloe vera are widely used in the cosmetics and alternative medicine industries, being marketed as variously having rejuvenating, healing or soothing properties. There is, however, little scientific evidence of the effectiveness or safety of Aloe vera extracts for either cosmetic or medicinal purposes, and what positive evidence is available is frequently contradicted by other studies. Aloe barbadensis is able to absorb between 80 and 90% of the formaldehyde present in water-based paint, roofing felt or insulation material, glues in fitted carpets or even laminated wood floors!